Three British men have been sentenced to a total of 43 years in prison in the United States for their part in one of the UK's biggest investment frauds. Richard Pope, Simon Odoni and Paul Gunter conned British investors out of £80m. This was then funnelled off into US bank accounts for them to enjoy a lavish lifestyle. The men were the backbone of an international crime gang that swindled at least 2,300 UK citizens. The City of London police believe it's the UK's biggest boiler room scam. "These men are amongst the most arrogant, ruthless and destructive criminals the City of London police have ever dealt with and deserve every day they will spend behind bars," said Det Insp Kerrie Gower, who led the investigation. The men co-ordinated what police described as a network of Spanish boiler rooms, employing hundreds of people to cold call investors, using high-pressure and misleading sales tactics to con them into buying worthless shares. Most of the victims were retired professionals whose losses ranged from a few hundred pounds to £1m. Andrea Goswami, from Yorkshire, still can't find the words to describe her loss. Her husband Mark killed himself after losing around £200,000. "How could they be so arrogant to think they could get away with it, and have no conscience about it, and just to destroy people's lives in this way, just for money and just for sheer greed, and is it greed that's all that it's about - they say money's the root of all evil and they are evil for what they've done," she said. "I'm never going to get my life back - the life I had with my husband, my chances of a happy married life with my daughter - we were trying for another child at the time, those hopes have been destroyed. Financially it's been devastating and it's a struggle, it will continue to be a struggle because of what they did." Mark Goswami's money, and all the other stolen savings, were used to expand the criminal network and pay for the gang's extravagant purchases. They included a £350,000 private plane, 26 properties and a number of luxury cars and speedboats. The sentencing marks a major milestone in a seven-year transatlantic investigation involving an array of law enforcement agencies, from Spain to Florida. John Joyce, special agent in charge in Tampa, Florida, said the case was a great example of how law enforcement partnerships worked on an international scale. "The United States Attorney's Office, HSI [Homeland Security Investigations] and the US Secret Service worked this case with their law enforcement partners from London to investigate, prosecute and convict Mr Gunter, Mr Odoni and Mr Pope. "Their sentences should send a clear message to other fraudsters." The fraud began in 2004 when Pope, 55, Gunter, 64 and Odoni, 56 acquired the identity of several fraudulent US-based companies. Call centres based in Spain were then used to try to sell fake stock to unsuspecting investors. Websites and glossy brochures were used to give credibility to the gang's bogus investment opportunities. The enormity of the case first came to light in 2006 when the City of London police linked a number of inquiries in the UK to activities under investigation by federal agencies in the US. Media captionWidow Andrea Goswami: "To destroy people's lives in this way, just for money - it's just sheer greed." "The devastation and the impact that victims have suffered has been huge and it's had drastic consequences to individuals lives - marriages breaking down, selling of properties, individuals losing their businesses, having to work again when they were about to go in to retirement," said Det Insp Gower. "The enormity and scale of the devastation, I can't even say in words what has happened in relation to this case." Andrea Goswami travelled halfway round the world to tell her story in a Tampa courtroom. "Going into the courtroom was the hardest thing I have ever had to do," she said. But she was determined to get justice for her husband. She said he was utterly destroyed by the realisation he'd been conned and the shame of losing everything he had invested in. Andrea only discovered the true scale of the losses after he died. "He didn't want me to worry about it. My husband's a very proud man and he would never have told me the truth, he would have soldiered on. If he hadn't been so desperate at that time, if he'd only been able to talk to me about it - we could've got through it. "He must have been so desperate about the situation and obviously didn't know what to do for the best - he'd feel like he failed us. It wasn't his fault but he wouldn't have seen it that way because that's the sort of person he was - very loving, kind and caring and very intelligent and wanted to do the best." Richard Pope, originally from St Albans in Hertfordshire, was arrested in Spain and extradited to the US. He pleaded guilty in March 2011 of conspiracy to commit mail and wire fraud between 2004 and 2008. In March 2013, the trials of Paul Gunter and Simon Odoni took place with Pope testifying against them. Both men were found guilty of three counts of conspiracy to commit mail fraud, wire fraud, as well as 19 counts of mail and wire fraud and 19 counts of money laundering. Pope and Gunter had originally worked together in insurance in the UK. Gunter had lived in London but later emigrated to the US. Odoni, also originally from St Albans, tried to avoid his bail in the UK by relocating to the Dominican Republic, living in one of the beachside properties purchased through the scam. He was later arrested in Florida while travelling through Miami Airport. Paul Gunter was sentenced to 25 years, Simon Odoni got 13 years and 4 months while Richard Pope received a far shorter sentence in return for his co-operation of 4 years and 9 months. 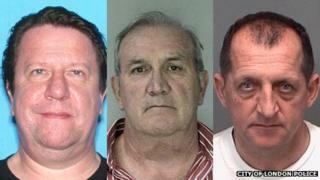 All three men are spending years behind bars. But no sentence will be long enough for Andrea Goswami and her family. "They've got families of their own. Would they do that to their own families? It doesn't even bear thinking about what sort of a mind they must have. To me it's incomprehensible and it makes me so, so angry that when I see what they bought with all the victims' money - they bought houses and boats and cars and property and left us with nothing. No amount of money can ever ever replace my husband."